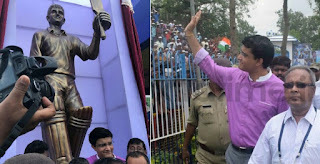 West Bengal, Balurghat: Former India captain Sourav Ganguly on Saturday unveiled his eight-feet tall bronze statue at Balurghat after travelling in train for the first time in 15 years. â€œI travelled in train once after 2001. Itâ€™s been almost after 15 years, Ganguly said as he alighted from the Padatik Express in Malda this morning. He headed to Bikash Maidan in Balurghat where he was greeted by thousands of crowd. At Dakshin Dinajpur, just human heads, the former lefthander tweeted.